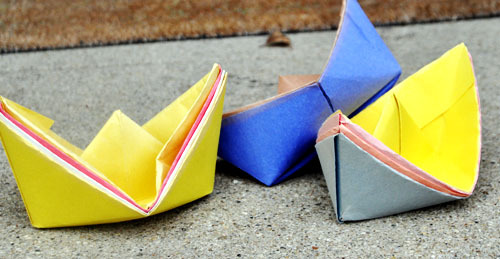 My little origami master made these adorable origami boats out of construction paper last year– or has it been two years? I love how the boats fit together in a nice neat little stack. I love their simplicity in design, and I even love the way the construction paper is fading so that the boats look a bit vintage. I figured out how to hang them, here. I keep stacks of these boats around little nooks everywhere upstairs, just because I love the way they catch my eye, always reminding me that I need to find some way to give them the prominence they deserve. For Thanksgiving, I’d like to string them up over our kitchen windows as “Mayflower” boats. Forget little brown turkeys — we’re going for colorful whimsical boats to brighten up our Thanksgiving. So, I think I’ll cover them with some polyurethane. But brush or spray? The temperatures probably aren’t warm enough to spray them outside, I think. The brushing would ensure a thick even coat — but will take forever, and it would be such a tedious job. Definitely spray… but just waiting on the right temps. Once “sealed” the boats should last a lifetime of Thanksgivings.